Today we were headed back to the mountains! This time though we planned to approach from a completely different angle and travel up the Kurobe Gorge. To get an early start we asked our hotel for a 6:30am breakfast time and made sure to set our alarms. The Kurobe Gorge is a rugged and heavily forested river valley located downstream of the Kurobe Dam in the Northern Japanese Alps. It is one of the deepest ravines in all of Japan and its scenic beauty can be well appreciated via the Kurobe Gorge Railway which travels up along the Kurobe River valley. One of the reasons we wanted to get going so early was because we were a bit worried about crowds on the railway as it was a Saturday. All trips on the railway have to be reserved and it’s actually possible to do so online. We didn’t want to go that far but made sure to monitor the website to see if it was getting crowded. It didn’t seem to be but we still didn’t want to take any chances! The Kurobe Gorge railway starts at Unaziki station which, from Toyama, takes between sixty to ninety minutes to reach by train. The station is served by the private Toyama Chiho Railway Main Line and it’s actually possible to travel the entire distance on this line from Dentestu Toyama (located near Toyama station) for a cost of ¥1790 and 85 minutes. 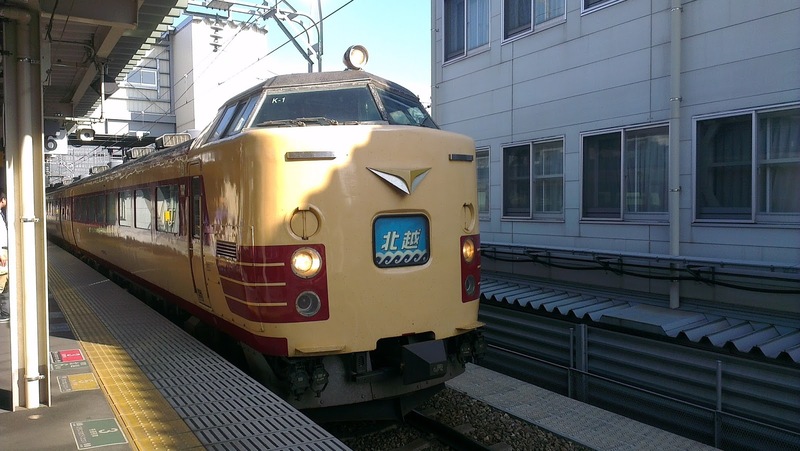 Since we had a Japanese rail pass though, it was more economical for us to catch a JR train first and then change to the private railway at some point before the two lines split. So we therefore planned to catch the 7:18 limited express Hokuetsu from Toyama to Uozu station. 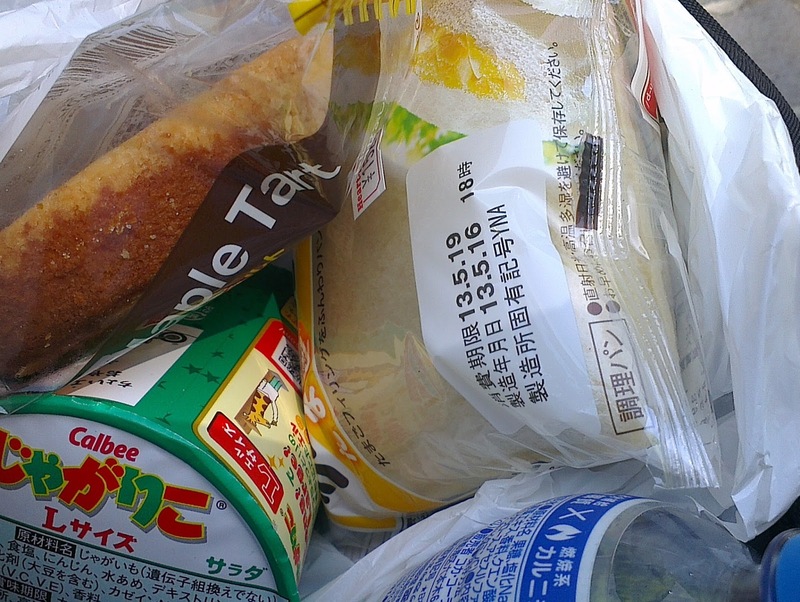 We were also hoping that we would have enough time after breakfast to pop into a convenience store to grab some lunch for today. On the way down the elevator we noticed on the wall there was a chart up display the different breakfast times and the number of people anticipated. I'm not completely sure but I think this was done to help try and balance numbers as we were only actually asked to give an estimated time. I guess that with this you would be able to come earlier or later if it looked like your time was too busy. This wasn't a concern for us at any rate as our time slot has a small number indicated and indeed, when we went down to the breakfast area we found only a minor amount of people. The area set aside for meals was designed in a Japanese style with low tables, tatami mats and seats. Thanks to a sunken floor everyone was able to sit in the western style though I think you could also sit on the floor if you wished. The breakfast was buffet style and we were able to choose from a number of individually portioned food items. 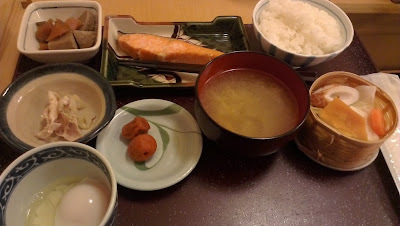 There were also a few foods, such as rice and miso soup, which we could dish out ourselves. Overall I’d say that the food was really delicious and there was a wide selection of options! I went for a nice piece of salmon, squid, miso soup, rice, an egg and a variety of vegetables. Kate made similar choices and went as far as stating that it was her favourite breakfast thus far. After breakfast we quickly went back up to our rooms to grab our stuff and brush our teeth. Upon returning to the ground floor used our wooden plaques to get our shoes out of the shoe cabinet. I actually had two pairs in the boxes as I had worn my runners out last night and Kate had come down earlier to swap her hiking boots for her runners as well. On the way to the station we had just enough time to stop by a convenience store, grab some food and then hurry down to the station platform. As mentioned earlier, our train was a limited express but since we were only travelling a short distance and were operating on precious little time we hadn't reserved seats. This was no problem though as we were easily able to find room in the non reserved car. After a comfortable twenty five minute journey we arrived at Uozu station. It was actually possible for us to change at the next station (Kurobe) which would be cheaper but would also involve a much longer walk through unknown streets which is why we decided to just take the easier option. The station we needed next, Shinuozu, is located right next to Uozu so we thought it would be a super simple transfer. Sure enough, upon alighting, we saw the platform we needed not too far away. It was located across a very large expanse of tracks and looking up and down the lines we found there was no obvious level or overhead crossings in sight! At the end of the tunnel we went up some stairs to the platform entrance where we found a ticket machine and a manned window. 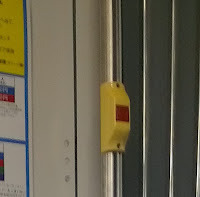 The machine looked simple enough so we pushed the ¥900 button, which was indicated as the fare to Unazukionsen Station. Once we had our tickets we showed them to the man at the window and went through the barriers to the platform. After twenty minute or so wait on the single island platform our train turned up and we hopped on. The train was just a regular local line service but was a bit a bit unusual inside and a few of the seats had tables. After our forty five minute journey though the Toyama countryside we arrived at Unazukionsen Station and walked down the well signed path with a few fellow passengers to the Kurobe Gorge Railway’s Unaziki Station located about 200 meters down the road. On the way we saw a few signs advertising the railways claiming that it was the best V-shaped valley in all of Japan. I loved how specific it was! Just before reaching the station we could see the scenic railway trains, they were very small and cute! The building was quite fancy and new inside with lots of electronic signs and an obligatory souvenir shop. There were a large amount of ticket windows although they were not all open as it wasn’t very crowded. We didn't immediately approach as we had yet to decide which of the three classes of carriages we wanted. The standard class was just an open carriage with backless bench seats; second class added small seat backs as well as windows and the first class had windows and full seat backs. We thought it might actually be more fun to sit in the open carriage and paid 1660 (first and second are 2180 and 2020 respectively) for a ticket to the Keyakidaira terminal. We figured if the lack of seat backs or cold air bothered us too much we could always pay extra on the way back. The window man actually asked us what train we wanted to get back but as we had no idea we asked if we could decide later, which was fine. The Kurobe Gorge Railway ticket system is actually pretty strict and you must specifically reserve each train. During high season it's usually necessary to decide up front exactly what trains to get there and back, including any stops at intermediate stations. Luckily, we did not have to worry about that and only reserved our first train, the 09:00 departure to the final Keyakidara station. With our tickets we were handed a Japanese brochure and assumed that there probably wasn't an English version. That is, until we saw a Chinese couple with one! Kate returned to the window and managed to procure an English one for herself. Ticket and brochure in hand we both proceeded to the end of a small queue near the entrance to the platforms and, after a short eight minute wait, rushed down to our carriage. We were in a hurry because although we had an assigned carriage the individual seats were unreserved and distributed on first come first served basis. Furthermore, we had read that there were far better views on the right hand side of the train. It seemed we were not the only ones with this information and everyone was walking pretty quickly to try and secure a seat. We needn’t have worried, as the small crowds meant that each person had one or two whole rows of seats to themselves so we were both able to sit on the rightmost edge. We still had about a ten minute wait for scheduled departure time during which a food troll lady did a lap of the platform. Various drinks and snacks were sold, though we didn't buy anything. 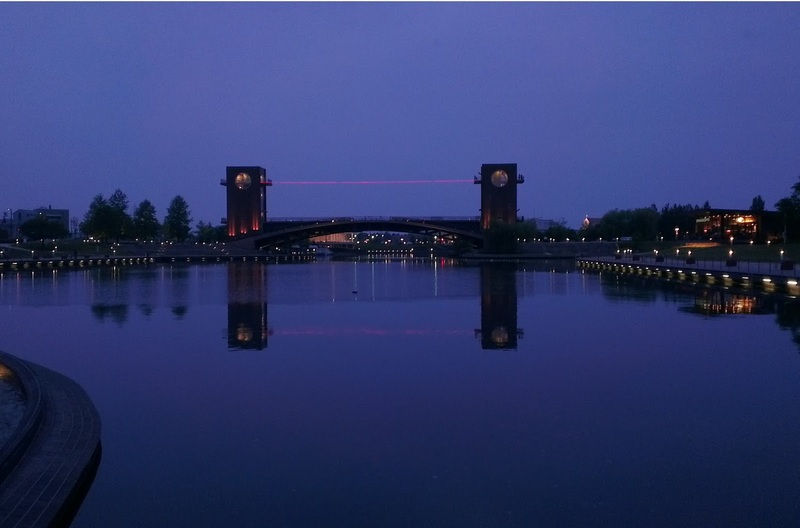 This is a photo of two nearby pedestrian bridges as seen from the Shin-Yamabiko Bridge. For a photo of the Shin-Yamabiko bridge see the photo right at the top of this blog post. Finally it was time to go and with a whistle of the horn we were off! As we pulled away from the station all the staff stood straight and waved us goodbye. The waving continued until we had disappeared from view. We first rattled over bright red Shin-Yamabiko bridge (新山彦橋 = New + Mountain + Lad + Bridge), which is a rare example of a sloping railway bridge. At 166 metres in length it’s actually the longest bridge to connect across Kurobe gorge. Once on the other side we then dove into our first tunnel and continued along the sinistral side of the gorge. Since the carriages were open we felt really exposed and close to the action, which was a lot of fun! The train sped up within the featureless tunnels and slowed down when there was a particularly scenic vista to view. The fresh air was wonderful, though it was a little chilly inside the tunnels! There were a few dams along the Kurobe River and behind each wall there was a pretty aqua coloured reservoir of water. The dams were built to generate electricity and one of the power plants we saw was shaped like a castle! The mountains on either side of the gorge were quite tall and between them we could see tributary waterfalls. We also passed and crossed a number of bridges, many of which were bright red. One particularly memorable river crossing wasn't built for humans but was strung across the river for our monkey cousins. It was built as just a single strung layer and definitely looked fit for only a monkey. Even so, some of the people bridges looked quite narrow and exciting themselves! While we didn't actually see any monkeys from the train we did happen to see a Kamoshika (カモシカ, Japanese Serow), which is a goat-antalope (Caprid) species seen as one of the national symbols of Japan. The railway line passes through quite a number of stations between the first and last through the scenic train only stops at two of these. The first was Kuronagi (黒薙= Black + Mow down an enemy) Station though most people, including us, stayed on the train as the station was located on the side of a steep cliff and apart from an Onsen Ryokan there isn't really a whole much that can't be seen from the train in the area. The most exciting aspect is the sixty metre high Atobiki bridge (後曳橋 = Behind + Pull + Bridge), so named because the steep walls on either side are said to cause even experienced mountain climbers to back away. After our brief stop at Kuronagi station we continued over the bridge which was exciting! We could see right down through the sleepers and bridge structure to the rapidly flowing Kuronagi River far below. Looking more at eye level and up the tributary gorge we could see an old grey bridge like structure which is the Suikyo (水路橋 = water + path + Bridge) aqueduct, built to transport water to a power plant from an upstream dam. Another aspect of dam and power plant operations visible were the long old bunker like structures that followed along the railways tracks for much of the distance. This above ground tunnel was built so the employees can access the dams and power plants during the heavy snow of winter. During these times the railway line becomes covered and unusable so the long path is the only option. There were a number of tiny holes in the side of structure as well as various access points along the way. At some of the aforementioned pass through stations we actually did make some brief stops. The stops were required so that trains travelling in the opposite direction could pass, since the route only had a single set of tracks. It was fun watching other trains chug past and the two sets of passages enthusiastically waved at each other. There was lots of waving all around actually as any workers we encountered along the way would stop whatever else they were doing so they could smile and wave at us as we passed. Everything along the route was well maintained and many of the trees had little signs with their names in Japanese. The major attractions were also well signed, such as the Dashiroppou (出し六峰 = to take out + Six + Peak), which are six limestone peaks that line up in such a way that it appears that they are each vying to be the tallest. Another attraction was the Nezumigaeshi Rock Face (鼠返しの岸壁= Mouse + Return + ’s + Beach + Wall) which is said to be so steep that even a mouse fleeing a cat could not scale it. As mentioned earlier, The Kurobe Gorge Railway is particularly crowded when the all the trees turn spectacular shades of red and orange during the autumn colours period. At the time we were visiting, most of the trees were a pleasant, albeit regular, shade of green though we did happen to see a few confused specimens here and there. Further along near the third station we saw the 759 metre tall limestone Higashi Kanetsuriyama. (東鐘釣山 = East + Bell + Catch + Mountain). The name comes from the fact that the mountain resembles a temple bell. We could actually get out here at Kanetsuri station though we didn’t as we had a ticket all the way to Keyakidaira and instead had a plan to visit the area on the way back. Just before reaching our destination we passed a man sweeping up leaves on a big concrete area with a straw broom. He looked like he had quite a task! Not long past that guy, our eighty minute journey came to an end and we got off the train at the single side platform of Keyakidaira Station. We then walked up from the platform to the station which was located inside a building with a few shops. Kate was thirsty and tried to buy some water from one of the vending machines. Apparently, up to now, she had been relying on the fact that all of the machines contained water and used elimination to work out which bottle to get. There were two clear liquids for sale at these vending machines and since one was clearly orange flavoured she figured the other must be water. It was some sort of sugary water which meant that Kate had to buy another bottle from a nearby shop instead. We had a little look at a few of the maps and such around the station but didn't hang around too long as we were keen to explore the area. First on our agenda was the Sarutobikyo (猿飛峡 = Monkey + Fly + Gorge) Gorge which is a beautiful fast flowing section of the river flowing between two steep cliffs and can be reached at the end of a scenic ten to fifteen minute riverside walk. We followed some signs down stairs and ramps leading down a cliff to the river but were soon stopped in our tracks! By no less than eight signs! And a well fixed barrier! I didn't stop to read all of the information but the gist was that the path was closed due to a high likelihood of dangerous falling rocks. All wasn't lost though and we could continue down the cliff to a viewing platform at the bottom of the gorge. Looking up the river we could see a small but energetic waterfall powering the rapidly flowing steam and looking further up into the sky we could see a pretty red bridge spanning across the chasm. In one of the corners of the observation area there is a large foot bathing facility though it was entirely devoid of people and water at the time. Speaking of the time, since it was 11am and nearly lunch time we decided to stop here at some seats to have our convenience store lunch. I had some Aquarius Zero, and egg sandwich some vegetable flavoured stick chip things and some sort of doughnut soaked in maple syrup. That last item was as bad for me as it sounds and was packed with kilojoules. Frankly I'm surprised it didn't just burst into flames. It was pretty big too. After lunch we climbed back up the hill so we could cross the long red Okukane (奥鐘 = Interior + Bell) Bridge we had seen from below. It was built for pedestrians and is located at a height of thirty four metres above the river. The bridge definitely felt high and it was fun to peer over the relatively low barriers to the water far below. It would definitely be all over if you topped down and a young kind freaked us out a bit by venturing very close to the edge! At the end of the bridge we came to the Hitokui Iwa (人喰い岩 = person + eat + rock), so named because the path is cut into the cliff face in such a way that it looks like the rock is gobbling up the trail and passing pedestrians. There was a rack of hard hats just before the cliff but since no one else was wearing them we continued on. We did notice a few sings about warning of falling rocks and stating that we were responsible for our own safety. The walk under the cliff was pretty fun and we could get a good view of the waterfall we had seen earlier. We even managed to observe a little rainbow floating in the fall's misty spray. After the cliff we continued along the path across another more basic bridge and came to another closed path sign. This one said that the trail was currently undergoing maintenance and indeed there were two guys on the other side equipped with leaf blowers. When open, the path leads to two onsen ryokan located about another fifteen or sixty minute walk away. It was the end of the road for us though and we turned back to return to the station. On the way back we noticed that some people had begun to wear the hard hats. We had already passed the danger area, but tried them on anyway. Once we reached the station the next train was due to depart so we rushed to buy a ticket to the next station. We were actually cutting it really fine and the train had all but left by the time we sprinted down to the platform. In fact, we were told by the conductor to just jump on the nearest carriage instead of our assigned one. Moments after we sat down the train departed and a short while later we arrived at Kanetsuri station. After leaving the platform we went and had a look at some of the shops spread out along the length of the platform on the other side of the barrier. Kate saw some ice-cream she wanted to buy but was unable to at first at there was no one to serve her. Eventually she managed to track someone down and pay but when she started eating it another one of the staff member came running over thinking that she had stolen it! I said we had already paid and a quick chat between the staff confirmed as much. We were profusely apologised to! One of the major attractions around Kanetsuri is the Mannen Yuki (万年雪 = Ten Thousand + Year + Snow) which is a deep wedge of snow that is often voluminous enough to last all the way through summer to the next winter. The station was build right next to the snow pile and we could see it from the train but for an even better view we climbed down some stairs to an observation deck. I don't know what it’s chances are this year but it looked pretty big and I hope it has lasted! The pile of snow had melted a bit underneath and we could see a dark cavity at the bottom of the pile of snow. Below this overhanging lip there were a bunch of widely differently sized boulders and rocks sitting on relatively finely grained sand. These rocks were probably brought there by the snow and then, as it melted, dropped out onto the finely grained material deposited in that calm section of the river. That'll do for today’s geology digression. Leading down to the river from the observation deck was an overgrown path that was closed as per usual. Back up the stairs though there was another path that leads down to a riverside hot spring which is the areas second major attraction. Near the start of the path there were a few prominent signs warning about falling rocks though thankfully none of them closed the path. After a short walk partially along the railway tracks and past a couple of onsen (paid) we came to a long set of stairs we used to climb down to the river. Once we reached the river bank we came to a couple of pools of warm water and I decided to put my feet in to soak. The water was really warm, refreshing and I enjoyed it much more than the one we had tried in Noboribetsu last year. There were a couple of other people around, though it wasn't very crowded at all. I think it was just two other groups, one of which I spoke to briefly about where we were from, as they made their way back to the stairs. There was actually more than one footbath and apart from the one I was using there was another closer to the river. Both pools had water temperatures posted on them. I was at the biggest one which had a rock wall partially built around it. My socks were quite wet and I wasn't looking forward to putting them back on when it was time to go at all. This was one of the reasons Kate decided to keep her socks on and instead opted to join my socks (from afar) for a soak in the sun. I didn't have a towel either actually and when it was nearly time to get moving again my feet joined my socks and Kate in the sun in a bid to dry them off. While my feet dried alright my socks did not fare so well, but I pulled them and my shoes on anyway and we decided to continued up the side of the river for a bit. We noticed that there were quite a few warnings signs about the place advising about the risk of dam releases, from the Kurobe dam I think. There were actually a few sirens that would sound at various points before the wall of water would reach our location. I don't know how often it happens but it unfortunately didn't while we were there. It would’ve been cool to watch the valley rapidly fill up. As we walked up the river we looked back and saw an official looking guy coming towards us. We thought we had done something wrong and he was going to tell us off but it turned out he was just coming over measure the temperature of a nearby pocket of water. We were still a bit spooked though and decided to head back to the train station. Climbing up the stairs was hard work and as we've often seen lately there was a countdown telling us how many steps we had climbed and how many we had to go. This is actually from our first train trip. Tunnels looked the same though! There were 282 all up! Upon arriving at the station we bought a ticket all the way back to the start of the line, skipping Kuronagi Station. After a brief wait our train arrived and we were off! We had a whole carriage to ourselves this trip so I decided to try and dry my socks in the breeze and Kate lied down on one the long seats. I sat right at the rear which let me lean on the wall to give my back a rest from the backless seats. My socks dried a little but not completely. Once we arrived back at Unazuki station we decided to explore the area and walked down to the pedestrian bridge we had seen from the train. The impressive Shin Yamabiko train bridge crossed the gorge only a few dozen metres away and we hung around a bit hoping that a train would travel past. It didn't seem like there would be one for a while though, so we continued across the bridge and encountered a Y-Junction. To the left was a path that led to a cool looking suspension bridge and on the right was a cool looking tunnel. We decided to cross the bridge first and then return later to explore the tunnel. The pedestrian suspension bridge bounced up and down slightly as we walked across and looking back we were able to get a good view of other bridges. Once we reached the other side we encountered a monkey! It was sitting on top of one of the support cables, I hope he wasn't planning anything! The path continued from the bridge through a bit of hilly forest before coming out at a vacant and overgrown car park. It didn't look like we could go any further from here so we returned back to the junction at the end of the first bridge. Along the way some people excitedly pointed out the monkey too us and we tried to feign surprise! It was quite dark and damp inside with water dripping from a roof that contained a few dim lamps. At the end of the tunnel we found an open entrance to a section of the winter path. It was quite narrow inside and would really be an experience to have to walk the whole twenty kilometres covered in deep snow. Out of the winter tunnel and a little further down the path we came to some sort of viewing platform that didn't really offer much to look at. There were a number of signs though that warned us not to give food to the monkeys and, sadly, not to throw rocks at the monkeys or Kamoshika. Next, we continued along the path and down a steep hill to a power plant near the base of the Unazuki dam wall. It was nowhere near the size of the Kurobe dam but was still quite impressive. There wasn’t any flowing over the top but we could see some churning in the pool below, so water was being discharged somehow. At the power plant building, there were some displays around a big glass window that let us see through to the inside. It looked pretty empty inside and there was no one else around. As we approached the window a blank TV suddenly lit up and a cartoon water droplet started loudly chattering to us in high pitched Japanese. It was pretty annoying so we didn't stop long to listen and had a bit more of a look around the area instead. I tried to use my phone to check when the next train would leave back to Toyama but found that I had no reception! Moving around a bit it was possible to pick up one bar but unfortunately this wasn't enough to use the internet. Since we didn't want to miss the next train, whenever it was, we decided it was time to head back. When we arrived we checked the train times and found that the next one didn't leave for a little while. We used this time to have a look in the few shops in the area and from one of these shops Kate bought an apple. Before too long it was nearly time for our train to leave so went and purchased a ¥900 ticket to Shin-Uozu station. After finding a seat our train took off on time at 4:03pm. 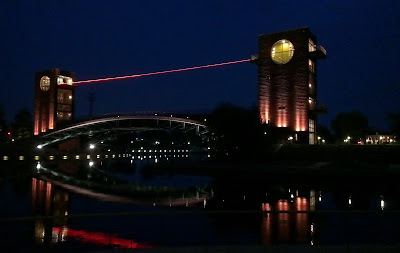 While researching Toyama City for The Japan Book, we had learnt that the Iwase Hikiyama festival was to be held tonight. The Iwase district is a northern port down of Toyama and the festival includes 13 floats decorated with big paper lanterns. The floats are pulled around to various different locations during the day and the night concludes with the floats being brought together and smashed into each other in front of the Suwa shrine. The closest station to the action is Higashi Iwase of the Toyama Light rail line which is connected to Toyama station via Toyama-eki-kita (Toyama-station-north) and a 21 minute (¥200) journey. After changing to a JR train at Uozu station we realised that Higashitoyama (east Toyama) was located only about 2.3km south east from the festival, which we could walk in about twenty five minutes. This would be a bit quicker than travelling all the way back to Toyama, and then transferring to the light rail. Plus we would save 200 yen! It was a pretty easy walk since the terrain was flat, and we were able to just follow one road for most of the way. There were not too many people around on the streets or at the station but it was nice to walk through the suburbia and watch the few people we did see tend to their gardens. Some of them were pretty good! The streets got a little complicated as we approached the shrine but we quickly worked out where to go with the help of Google maps on my phone. As we drew quite close it was still pretty quiet and we thought that we might not find anything. However, once we were nearly there people gradually appeared and by the time we reached the shrine we found mass of stalls and people. Most of them seemed to be food stalls and unfortunately the area actually looked rather dirty so we didn't buy anything. Some of the food included chocolate covered bananas, taco (octopus balls), crepes, toffee apples, popcorn, chips, corn and an organic smoothie guy. Just outside the shrine on the surrounding streets there were more stalls, though they looked a little more dodgy. Apart from the food stalls, there were also a few games like scoop the goldfish with a paper net to win, which we didn't play for obvious reasons. After having a look at all the stalls we explored the surrounding streets and found some of the floats. They definitely looked impressive and were big, tall and well decorated. On top of the floats there were a few young ladies and at the bottom of one we saw a group of young men untangling rope which they would use to pull it along. Both the boys and girls were dressed in a sort of Kimono uniform, blue and green respectively. While we were looking around the sky was still quite bright and it didn't look like anything was really going to happen for some time yet. Judging by the photos and the information we had, it looked like the main event would not occur until it was properly dark, and probably not before 8pm since it finished at 9pm. Unfortunately, it was only a little past 6pm when we arrived and after a bit of consideration we decided to head back to Toyama and to just appreciative the floats in their static form only. It had been a big day and we were pretty tired and hungry. Not far from the shrine we found the Kenrinjo-mae Station and after a short wait got on the tram/train (traim?). I'm actually not sure what to call it as it was a bit of a cross between both; I guess that's what is meant by light rail. The station and vehicle were quite new looking and I noticed that stop buttons inside were shaped just like the ones on Brisbane buses! 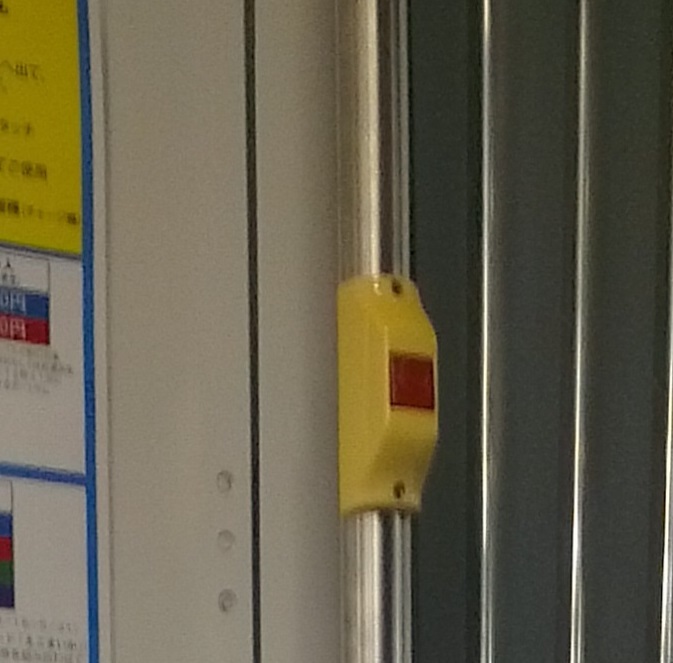 Just like a bus you needed to make sure to press this bell so the traim would stop at the next stop. We had to press it ourselves since we wanted to get off an earlier stop (no one else did) to have a quick look at a bridge that is apparently well lit up and impressive at night. The bridge spans an artificial pocket of water and doesn't actually serve any practical purpose but is instead part of the artistic qualities of a recreational space. The bridge and area was pretty good and worth the look. We found a fancy looking Starbucks on a grassy knoll nearby and popped in to grab a hot drink and something to eat. Yet again there was no cherry muffin so I got a blueberry scone instead. After our snack we went over to the bridge, and discovered that it was actually possible to climb up the support towers! We did so to receive a great night view of the park and city buildings in the distance. 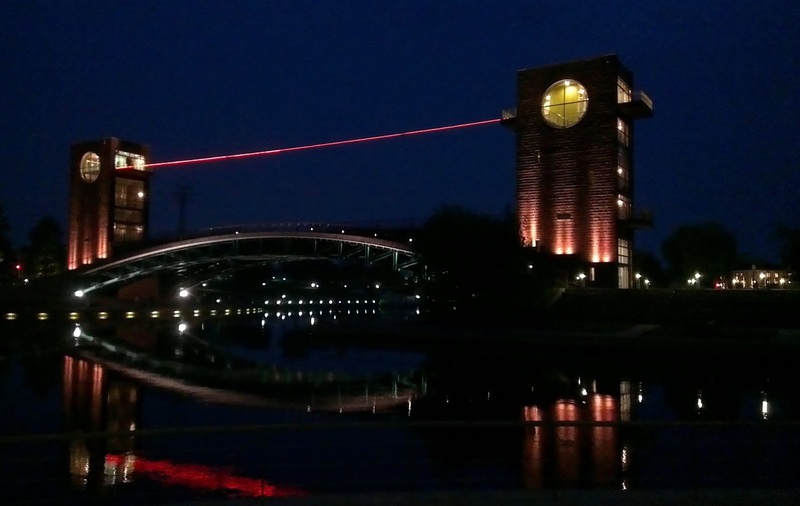 At the top we could also see that the red laser beam connecting the towers was actually just a normal light shining on some wire. After climbing back down we crossed the bridge and finally decided to call it a night and head back our hotel. The walk back took us past some people practicing Karate, a gym with patrons doing laps of the complex inside, as well as a set of bikes just like what we have in Brisbane! 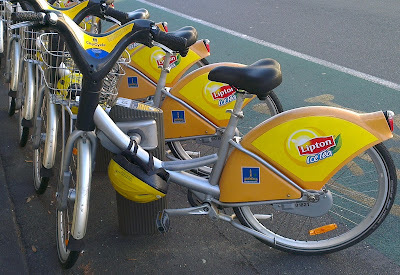 Ours are called City Cycle, yellow, and are a bit of a failure as people rarely seem to ride them. 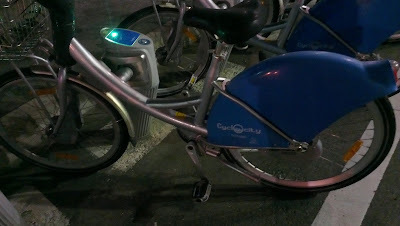 The ones in Toyama are called Cycle City and are blue! As you can see, apart from the name and colour, they are identical! Actually, along with the button on the traim that makes two public transportation similarities between the two cities. I wonder if there's anything else I didn't notice? Our Concept Hotel Wa-Q was on the other side of the railway line and it turned out that we could only cross at the station, which made the walk take a little longer than we hoped. On the way through one of the minor entrances we stopped at a ticket window to obtain tickets for tomorrow’s journey to Nagoya. The lady who printed our tickets seemed a bit confused and it took her a while for her press the buttons required to print our tickets. I guess she might not print that many long distance tickets at this small window? Or maybe just new to the job? At any rate, she was pretty friendly and we didn't mind the small wait. Actually, additionally, when she did get them printed they were in Japanese so she sucked them back in and made English versions. Though I would've happily taken the Japanese ones! I feel a sense of achievement on the rare times we get them. After checking our tickets we thanked the lady and walked though the station and back to our hotel. After her success yesterday Kate once again risked a bath in the hotel's public bath and was lucky enough to once again encounter no one inside! I didn't risk it though and just had a shower in our room. I think we watched a bit of TV after that, and it so happened that they were doing some kind of travel show about Australia and Melbourne in particular. It was quite interesting to learn about Australia from a Japanese perspective and we probably stayed up later than we should have. Anyway, after watching TV for a bit it was bed time, and that ends today! Huge apologies for the lateness of this post! I might have to re-evaluate how feasible weekly posts are! Are you considering visiting or have you recently travelled to the Kurobe Gorge or Toyama? Thank you very much for taking the time to read my post, I'm very glad you found it useful. And I'm thrilled that you took the time to make a comment- thank you very much! I'm sure you'll have a lot of fun in November- not long to go now! We had a blast and at that time of year you'll have the added bonus of the beautiful autumn colours. I'm jealous! Hey there! We're planning to head to the gorge in summer too, and had so much trouble finding info, until we stumbled upon your site! I'm really happy to hear that you found this post and found it useful! Thank you very much for taking the time to leave a comment! It means a lot! Very useful write-up as I'm planning to visit Kurobe Gorge from Garaku at the end of September. Thank you for all the details . I hope you have a great time in September- I'm sure you will, Kurobe gorge was a lot of fun! Sorry for the lateness of my reply too! Google decided to lock me out of my account while I was in Japan! Hi! I was researching on Kurobe Gorge and found this excellent post of yours! Well done. I find it hard to navigate around the railways in Japan. How did you find out which railways to take to the gorge? I'm really sorry for the lateness of my reply as well- Google blocked me from logging in while I was in Japan recently. You have to be a little careful with the station names, but it's very smart otherwise and even knows how long it takes to make transfers. It gives you more time for longer transfers for example. It's also available on android and probably apple as well. Also it often helps to uncheck airplane and shuttle bus. Thanks for sharing your experience at Kurobe Gorge! Im planning to go this early August. I wanna ask how and when did u purchase the tickets to the gorge? Did u purchase urs in advance? I kinda wanna buy them in advance, and I know u could reserve tickets online (a Japanese site), by phone, through an agent or purchase at Unazuki Station. I worry that it might be late to buy at Unazuki Station just a day before I go to the gorge. Another question I wanna ask is about the JR Pass... I read about it saying that it includes most trains except for some... I don't know if it covers Aonami Line (because Im planning on going to the JR Museum), Toyama Chiho Railway or Ainokaze Toyama Railway (I used Hyperdia too and got these train names lol) Do you know if the pass covers the above mentioned railways? Thanks!! What dates in early August? August can be one of the busier months due to the summer holidays and also Obon week which will get very crowded around August 8, 12 and 13 this year. We purchased our tickets on the day when we got there and it wasn't crowded at all. The trains can hold quite a few people and on the way back we got a whole carriage to ourselves. Then you can select a date (up to three months in advance, but after 28/05/2015) and see how busy the various times are so far. O is lots of seats, △ few seats and X no seats. It looks like you might able to reserve tickets online, but pay later, though I not 100% sure on this. It's all in Japanese and expects a Japanese phone number/address too so you will probably be best off using an agent if you're concerned about if filling up. I think if you can buy it the day before you'll probably be ok on all bust the most busy days (Autumn colours). I honestly think you should be fine to just turn up unless it's the peak of Obon perhaps. Broadly speaking, on Hyperdia, the green trains (and shinkansen except Nozomi & Mizuho) are valid for JR travel and the pink ones are not. There are very small number (3 at the moment) of pink trains that are valid with the JR pass and sometimes there is a supplement JR users have to pay when travelling on JR trains (green) that run on non-JR tracks. Hi, I'd like to ask if it's possible to do a day tour from Tokyo or should we book a in Toyama? Thanks in advance. When I wrote this it would not really have been possible to do it as a day trip, but now thanks to the new Hokuriku Shinkansen you can! It's definitely a long day from Tokyo though, about three hours travel time each way, but if you catch a 06:30 or 07:52 shinkansen from Tokyo you'll get there by 10:00 or 11:00 which would be enough time. I'd try for the 06:30 train though if you can. You should not have too much trouble getting back to Tokyo in the afternoon- any time would be fine (whenever you are ready). I'm sure you'll have a great time! Thanks for sharing such a detail journey on Kurobe Gorge, this definitely helps planning for the trip much easier for everyone. I will be travelling with my family of 3 young children (age 11,8 & 4) in last week of Nov this year. Do you think it would be suitable for them? Did you see any family with young children along the way? Also, would you know, if the train would still be operating till last week of Nov, as I read somewhere is only operating till Mid Nov. Yes, the trip would definitely be suited for children and we did see some families with children as well as some big groups too. I think they'd have a lot of fun! I would make sure your kids don't get trained out though, when I was a small child we went on a scenic ride on a steam train but to get there we had a three hour one way journey on a regular commuter train- once we arrived I'd had enough! Though that was before anyone had access to things like ipads and such to keep them entertained and Japanese the shinkansen is a lot more fun than a normal Australian train. The train will still be operating until the last week of November don't worry! I have the following plan, similar to part of your trip. Could you please let me know if it is feasible with 3 young kids? 25 Nov Kurobe Gorge & Toyama, spend another night in Toyama? 26 Nov Make our way to Kanazawa and spend a night there? 27 Nov Make our way to Shirakawa-go, spend a night in Shirakawa-go farm house. Do you think it is sufficient to just spend a night or should we stay 2 night? Thanks for taking the time to lave a comment! I haven't made any kids yet so I'm not sure what it's like but I'm assuming it'll be important to try and have a plan for luggage. There's a service you can use to send it over the alpine route, and you might be able to use lockers at other times. On the 25th I'd travel all the way down to Kanazawa as there's the new shinkansen open there now- it's only a 35 minute trip from Kurobe Unazuki Onsen station! Two nights will be good in Kanazawa, there's a fair bit to do there. I haven't been to Shirakawa-go but everything I've read suggests either suggests a couple of hours or one night in a farm house. The farm houses are highly recommended. Just one night is perfect, two would be too many. Travel from Shirakawa-go to Kawaguchiko is a huge trip, maybe 6 hours, you might be much better of doing Kawaguchiko before matusmoto as it's much more on the way. Hakone is not in Tokyo, but relatively near to Kawaguchiko, I'd probably pick just one or the other. If you want a day trip from Tokyo Nikko and Kamakura are good options. Maybe Kamakura as Nikko might be a little cold. There's plenty to do in 3-4 days in Tokyo though. Thanks for your reply. Do you think the following is more feasible instead? Also, do you think it would be advisable for us to purchase the 7 days or 14 days JR rail pass in this case? Please advise. Sorry to keep bothering you, as there is no tourist office in our country for us to ask queries directly..
Yep that looks really good now! Definitely just get the 7-day rail pass. It's best to exchange it when you arrive on the 22nd (it's easiest at the airport), but make sure to set it to activate on the 23rd. Once you exchange it you can then book your trips if you like (even before it is active). It will last until you get to Kawaguchiko on the 29th. From Kawaguchiko I would just get the bus back to Tokyo (2 hours; 1,750 yen), it's actually quicker and cheaper than the train. You can catch the bus and buy tickets from the train station. No worries, I'm glad I can help! Thank you so much for your kindness sharing this. It helps us a lot. One thing I would like to make sure that is about the train route. I have read from one post that the train does not go to the entire route until May 28th in every year. 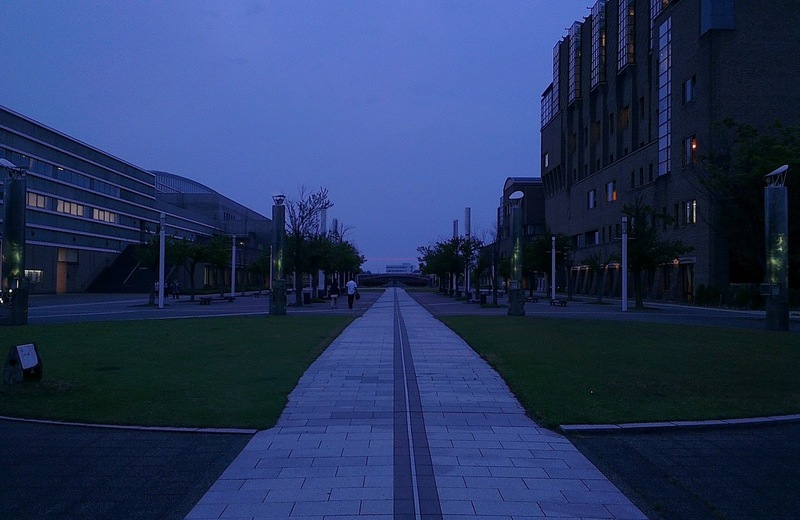 It starts from Unazuki station and ends at Sasadaira (one station upper to Kuronagi station). But from your post, you went there on May 18th and the train reached to Keyakidaira, right? That's mean the train ran all along the entire route already. Please help to comfirm me again about this information.I have planed to visit there on May 12th, 2016. Hi! Thank you for reading! I had a look around and I couldn't find anything that said the route doesn't go the entire way before the 28th. The closest I could find was a timetable that was updated from the 28th of may in 2015 but that just changed the times not how far the train went. We definitely went there on the 18th May and did the entire route. I think you'll be fine! And thanks again for your posts, they are really helpful. It was really good info about Kurobe Gorge that you've did. I have a few questions regarding the trip to Kurobe Gorge. I'm planning to have a day trip to Kurobe Gorge from Toyama on 19th April 2016. As i'm still planning my itinerary for now before i travel to Japan. Is it available for me to have a visit on that date? As i'm noticed, the Kurobe Gorge are not available through the year right? If it can be done, how I can get there from Toyama Station? It there any bus that I could take? Will to be able to go on the 20th instead? If you happen to have a railpass catch it to Kurobe Unazuki station and change to the Toyama Chiho Railway there. Thank you for your excellent post and pictures! Our plan is to visit somewhere between 8-14 may 2016 (for one day). I was wondering what the scenery looked like in may as google would only show me the autum pictures! Thanks to your wonderfull pictures I'm only looking more forward to our upcomming visit. No worries, thank you very much for reading! Autumn is nice, but I actually quite like the green scenery as well- its very refreshing and1 different hue compared to colour of our trees in Australia. Another advantage of May is you're probably not going to encounter many crowds (as long as you avoid golden week which it looks like you will). I am thinking of venturing into Kurobe Gorge since i have one free day in Toyama which falls on 3 May (not sure if it gonna be crowded). From reading your post, you mentioned that you had to purchased another ticket at every station you alighted. Does it mean that if i buy a ticket from unazuki to Keyakidaira, i can only alight at Keyakidaira, and any stop in between that i make, i would have to purchase another ticket? Kinda confuse here. Hope you can enlighten me bit. I would say May 3 is going to be crowded :) It should still be alright though, just be aware of that and make sure to allocate extra time. I think you could also buy all your ticket at once.